Before leaving the sphere of government, there is another important question that must be addressed, and that is the question of Sovereignty. To whom do we turn as the ultimate authority, the One who will answer the question, “How shall we live?” I can think of only three options: The sovereign individual, the sovereign state, or a sovereign God. If the individual is sovereign, that is… if I make up the rules for “my world” and my neighbor makes up the rules for his, we invite conflict because there’s really only one common world, and if every person makes up his own rules there will be nothing to hold communities together. It’s all well and good, (up to a point), when we each live as we choose in our own home. But once I step into the street there must be a common understanding of the world we live in; of it’s morals, ethics, laws, and values. Nature itself shows us a world of common laws which bring order to human existence: sowing and reaping, mathematics, gravity, motion, etc. Existence without unifying laws equals chaos. 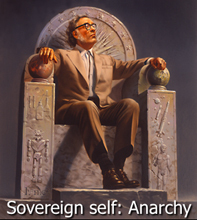 When the individual is sovereign, anarchy reigns. And anarchy simply doesn’t work. In today’s culture we’re more likely to choose the alternative route of the sovereign State who, like a kindly older brother will arbitrate disputes and make choices regarding justice, fairness, and life together. Certainly this idea has been tried from the Pharoahs of Egypt to the Parliaments of Europe. And it even seems to have some success for awhile. In a Utopian world where man and motives are pure-hearted and true, the sovereign Government might work. But in this case both human nature and history testify against us. Humans in the real world are corrupt and greedy by nature, and the more power they’re given the more greedy and corrupt they become. Apart from a higher accountability Governments inevitably fall into immorality and blind ambition. Never in human history has a government, adrift from God, sustained itself in goodness and benevolence towards its people. We are witnessing at this very moment, the slow, steady decay of the free world into corruption and greed. 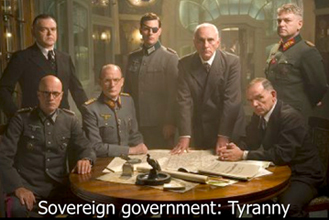 The sovereign government is a tyrant. And if it isn’t today, left unchecked by a higher Truth, it will become one tomorrow. Which brings us to the remaining option, the only one which offers both freedom and order in a world of diversity. If God is sovereign, and if we understand His true nature as a Servant-King, He unifies nations with love, orders them with justice, and liberates them with true freedom. Jesus demonstrated the true heart of government which values not the strong arm of power, but the beauty of selfless service to its neighbor. This is the government of the Kingdom, and the closer we come to that model, the more freedom and life we will enjoy. (Much of my understanding of government comes from my friend Bill Burtness and his wonderful book, The Third Alternative. I highly recommend it as a primer for Biblical government). Previous PostMissing pieces: grace and governmentNext PostMissing pieces: freedom, truth, and education. I like the images on your posts, Don. 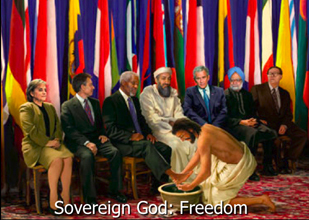 I particularly like the one where Jesus is washing the feet of world leaders. This says it all. I have been reading passages from Hans Kung’s “On Being a Christian” regarding the role of the Christian in society. Kung states that Christ calls His people to neither violent revolution nor withdrawal from society in some sort of monasticism. Jesus calls us to follow him in service to God and man – everywhere…everyday. Through our attitude of servanthood and simple acts of service, Christ transforms the world around us until that Day when He appears to bring an end to everything in this world that hinders love. Thanks for the reminder that true freedom is found in service to God and others. Thanks, Sean. Your insights are consistently rich and insightful. I always get excited when I log on and see that you’ve left behind some thoughts to ponder. Danika! How good to see you! That’s a wonderful question that deserves a thorough answer. My little pea-brained opinion is that God is, and always will be sovereign, and yet he chooses to share history and responsibility with us. His command to “take dominion” implies that he steps aside and defers at least a portion of the driving to us. To be created in His image means that our lives DO make a difference in the real world. And YET He can override any of it any time He chooses. He is a God who gives us freedom to choose and act while at the same time preserving His sovereignty to go behind us and cause “all things to work together for Good” when we are acting out of love. IMHO it’s both sovereignty and free will. Dude these images are awesome. Where did you get the one with Jesus washing the world leaders feet? Where can I get a much bigger version of that?